President Donald Trump talks with reporters before departing for France on the South Lawn of the White House, Friday, Nov. 9, 2018, in Washington. 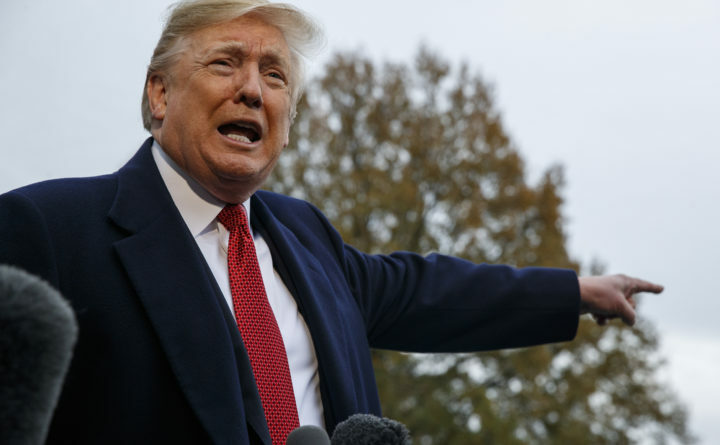 WASHINGTON – President Donald Trump on Friday sought to play down speculation that he had appointed Matthew Whitaker acting attorney general to curtail the special counsel investigation, telling reporters that he doesn’t know Whitaker and hasn’t spoken to him about the probe. His comments came two days after Trump ousted Jeff Sessions as attorney general and installed Whitaker, Sessions’ chief of staff and a former U.S. attorney in Iowa, as the top official at the Justice Department. The Washington Post reported this week that one of the reasons Trump liked Whitaker was because Whitaker had briefed him on many occasions because the president preferred not to talk to Sessions, whom he had often disparaged publicly. Since stepping into his new role, Whitaker has faced questions – principally from Democrats – about whether he should recuse himself from overseeing the special counsel investigation into Russian interference into the 2016 election, given that he had previously criticized the probe in opinion pieces and as a television commentator. Whitaker’s appointment has also prompted questions from Democrats about whether Trump brought him aboard to curtail or shut down the Mueller investigation, which is examining possible coordination between Trump’s campaign and Russia and potential obstruction of the probe by Trump. While claiming not to know Whitaker, Trump praised him as a “very strong person with a very strong personality,” saying that’s what the Justice Department needs at this point. In recent days, Whitaker has faced a great deal of scrutiny in the media, including for his service on the advisory board of an invention-promotion company accused of fraud by customers. Trump also sought Friday to dismiss the notion that Whitaker should recuse himself of oversight of the Russia probe. Trump suggested he would have few choices for attorney general and other top government posts if he eliminated everyone who had been on television. “Do we have to hire somebody in a shell? I don’t think so,” Trump said. As a television commentator before taking the job with Sessions, Whitaker floated the idea of defunding the Mueller probe. He said it would cross a “red line” for Mueller to investigate the finances of the Trump Organization. And he said that it was “ridiculous” for Deputy Attorney General Rod Rosenstein to have appointed Robert Mueller, as opposed to running the Russia investigation through regular Justice Department channels. The Washington Post reported Thursday that Whitaker has no intention of recusing himself from overseeing the special-counsel probe, according to people close to him. Trump also sought to brush off suggestions by some lawyers – including George Conway, husband of White House counselor Kellyanne Conway – that the Constitution requires Whitaker to be confirmed by the Senate before he starts serving. Schumer also asked Trump questions, including whether he had asked Whitaker for a pledge of loyalty. Speaking to reporters, Trump claimed that Whitaker was “confirmed at the highest level” because his nomination to serve as a U.S. attorney in Iowa had been approved by the Senate. Trump also complained that Mueller was not subject to Senate confirmation before he began serving a special counsel. Asked about potential permanent replacements for Sessions, Trump said he likes former New Jersey Gov. Chris Christie, a Republican, but has not spoken with him about the job.